The gray hand brake boot. 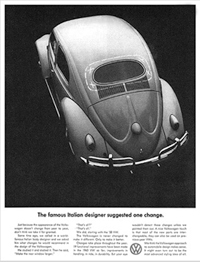 On August 1, 1957 Volkswagen enlarged the rear window on the Beetle and, according to one of Volkswagen's popular advertisements from 1960, at the suggestion of a very famous Italian body designer making the 1958 model year the beginning of the square window Beetle. The 1958 model year Volkswagen Beetle encompases Beetles built from August 1, 1957 until July 31, 1958 having chassis number 1 600 440 ranging to chassis number 2 007 615. And while the ad boasts only one change, these Beetles show major obvious changes from the previous 1957 oval window model. The rear window and front windshield were made much larger making it easy to spot a new Beetle driving around in 1958. The sunvisor changed shape to be rounded on the outside upper edge to fit with the new windshield but still is made of green transparent plastic. The dashboard was redesigned with a larger glovebox, the ash tray moved to bottom center of dash, and the radio moved to center of dash with wiper and headlight buttons above, the speaker is now located to the left of the speedometer, and the ignition to the left of the ash tray. Other changes are the front turn signals moved to top of fenders in U.S. specification models but European models retained the semaphores. The "W" decklid is dropped for a less shapely one, and a flat type accelerator replaces roller type. The convertible Beetle received horizontal air inlets replacing the previous vertical inlets. All Beetles received wider brake drums and shoes. The frame head was reinforced and a new clutch release assembly with stronger clutch springs was added. The third and fourth gear ratio changed in the transmission. There are several difficult parts to find to restore a 1958 Beetle, such as the sunvisor which is a one-year only part. You'll find a lot of oval window Beetle owners installing the 1958 sunvisor in their cars, but the more square oval window era visor does not fit the 1958 Beetle quite right. 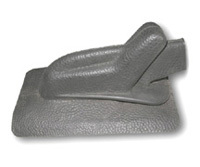 The gray hand brake boot with pebble texture is next to impossible to find, and while I've found several NOS black pebble textured boots I've only found one used gray one in fair shape. Not everything changed of course, some features on the 1958 Beetle were carried over from the oval years. 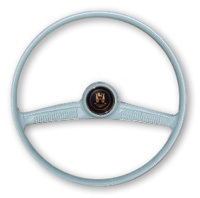 The speedometer is the same as previous years, the tail lights are the same as 1956 and 1957, the steering wheel (above) also carries over from these years, as well as the pull style outside door handles and the doors and hood. Like the late oval window Beetles, the engine is still 36hp SAE, and the transmission is a split case with a non-synchronized first gear and the gas tank is the same shape with a hump and 80 mm cap. Of course, there are many other parts shared with the oval window Beetles, such as switches, knobs and inside door handles, etc. Are you restoring a 1958-59 Beetle? Then visit the '58/'59 Discussion on TheSamba.com for help with restoration questions, you can also search the classifieds for that original part you just can't find anywhere else. There's also a Facebook group continuing the discussion (you must log in to see the group).